Indie-folk musicians Ira Wolf (TN) and Lee Henke (MN) visit Gallery 263 on their spring tour! Local musician Conor Ryan Hennessy opens. With more than 30 million plays on Spotify, Ira Wolf has exploded onto the folk scene over the past three years. 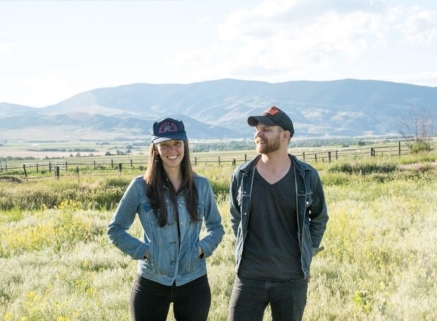 Hailing from the mountains of Montana, and making a home in Nashville, TN, Wolf’s music and writing connects with audiences on a deeply personal level through melancholy vocals and vulnerably honest lyrics. With three studio albums to share, Ira has performed on stages across the U.S., parts of the UK, Scandinavia, Southeast Asia, Australia, and New Zealand since she began touring in 2014. She spent much of 2016 promoting her sophomore album Honest on The GoWesty tour in a 1988 VW Vanagon, performing and climbing mountains across a majority of the U.S. before returning to Nashville to finish her third record. The Closest Thing To Home made its debut on September 9th, 2017, followed by another nation-wide solo tour. Ira maintains a busy schedule on the road and plans to tour the US extensively in 2018 with the release of her first vinyl record. In a small cabin in the north woods of Wisconsin, Lee Henke works tirelessly at his craft. A midwestern singer-songwriter who is sincerely dedicated to quality and simplicity, he delivers well-constructed songs with a even blend of contour and grit. For the past 5 years, he has been touring the country with Minneapolis-based folk band, The Last Revel. He released his first solo effort entitled Schema EP in September of 2015.